Earlier this month The Economist released its own article on Thorium based nuclear power with it reporting on India and China making the biggest strides as they both try to meet their ever-growing energy demands (without having to revert to coal or gas-fired generation). WELL begun; half done. That proverb—or, rather, its obverse—encapsulates the problems which have dogged civil nuclear power since its inception. Atomic energy is seen by many, and with reason, as the misbegotten stepchild of the world’s atom-bomb programmes: ill begun and badly done. But a clean slate is a wonderful thing. And that might soon be provided by two of the world’s rising industrial powers, India and China, whose demand for energy is leading them to look at the idea of building reactors that run on thorium. Existing reactors use uranium or plutonium—the stuff of bombs. Uranium reactors need the same fuel-enrichment technology that bomb-makers employ, and can thus give cover for clandestine weapons programmes. Plutonium is made from unenriched uranium in reactors whose purpose can easily be switched to bomb-making. Thorium, though, is hard to turn into a bomb; not impossible, but sufficiently uninviting a prospect that America axed thorium research in the 1970s. It is also three or four times as abundant as uranium. In a world where nuclear energy was a primary goal of research, rather than a military spin-off, it would certainly look worthy of investigation. And it is, indeed, being investigated. India has abundant thorium reserves, and the country’s nuclear-power programme, which is intended, eventually, to supply a quarter of the country’s electricity (up from 3% at the moment), plans to use these for fuel. This will take time. The Indira Gandhi Centre for Atomic Research already runs a small research reactor in Kalpakkam, Tamil Nadu, and the Bhabha Atomic Research Centre in Mumbai plans to follow this up with a thorium-powered heavy-water reactor that will, it hopes, be ready early next decade. China’s thorium programme looks bigger. The Chinese Academy of Sciences claims the country now has “the world’s largest national effort on thorium”, employing a team of 430 scientists and engineers, a number planned to rise to 750 by 2015. This team, moreover, is headed by Jiang Mianheng, an engineering graduate of Drexel University in the United States who is the son of China’s former leader, Jiang Zemin (himself an engineer). Some may question whether Mr Jiang got his job strictly on merit. His appointment, though, does suggest the project has political clout. 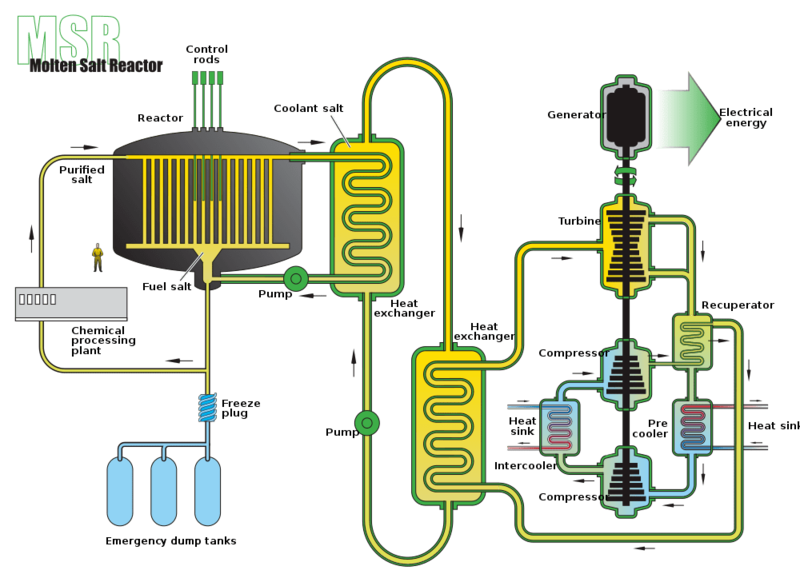 The team plan to fire up a prototype thorium reactor in 2015. Like India’s, this will use solid fuel. But by 2017 the Shanghai Institute of Applied Physics expects to have one that uses a trickier but better fuel, molten thorium fluoride. The rest of The Economist article carries on listing the benefits and challenges of Thorium based power. I noted in the Wikipedia article that Thorium based nuclear energy could even be used for what is known as nuclear desalination (using nuclear energy to turn sea-water into fresh water). Nuclear desalination already happens on a limited scale and you can read about it HERE. In a sense of irony the late Gerry Anderson’s ‘Thunderbirds’ had an episode (one of my favourites) called the Mighty Atom where in 2065 the Australians and later north Africans used nuclear energy to turn sea water into fresh water for use of irrigation in the Earth’s deserts (most likely to address the growing food shortage in that era). However, the arch-villain The Hood had accidentally set off a chain of events that destroyed the Australian atomic irrigation station (nearly poisoning Melbourne on the way), while a year later committed a deliberate act of sabotage to the Saharan atomic irrigation station to attract out International Rescue who would go on saving the station. Cult classics aside, nuclear energy was once touted as a large-scale replacement to fossil fuel power generation for large industrialised or industrialising accidents. However, convention nuclear power (that uses uranium and plutonium) has suffered a series of critical set backs (three major meltdowns) that will never allow it to be as widespread as once promised in the 1960’s. But we can also not continue to increase our waste gas emissions from increasing fossil fuel use as the world economy (well) splutters forward. Solar and wind are good for micro and localised uses while hydro meets resistance owing to dams changing the ecology of the river being dam-ed (or damned). Thorium-based power could give an answer to our large industrial and industrialising countries that is clean and goes some distance in weaning that country off fossil fuel based power generation. India and China see the potential so it is hoped that other nations including the Americans (who bottled the technology effectively in the 60’s when they realised Thorium reactors could not produce nuclear weapon fuel for their Cold War “efforts”). And as fresh water becomes more scarce, nuclear desalination could provide assistance in turning sea-water into potable water for both drinking and irrigation.